Need a gift for First Communion? The perfect gift for every child ages 7-9 on this most important occasion! This book has the color illustration and textual simplicity to appeal to children around the age of 7, and the charm and respectfulness to appeal to the adult buying the book. Designed with a fill-in page to commemorate the event, and space for a photo to be stuck in, My First Holy Communion contains prayers on the themes of praising God, remembering baptism, coming to confession, taking part in Holy Communion, and living a Christian life. This keepsake concludes with a section of appealing and reassuring blessings and will be welcomed not only as a memento of a special day, but as an encouragement to grow as a Christian throughout one's life. 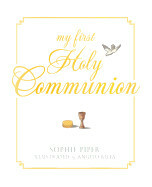 Sophie Piper is the inspiring author of many books for young children, including the Paraclete Press bestseller, My Baptism Book (nearly 30,000 copies sold so far), Prayers for Each and Every Day, and Poems & Prayers for Easter. She lives in the Thames Valley, England.